The crew enjoyed a few days of rest and relaxation while the Collins Class submarine, which is based at HMAS Stirling in Western Australia, underwent routine maintenance. Bachelor of Applied Science (Nautical Science) student Anit Singh described the tour as a “great experience” and was especially impressed with the internal utilisation of space to accommodate the 60 crew members. “It was a great experience and I would like to thank the Navy and University of Tasmania for this once-in-a-lifetime opportunity,” Mr Singh said. 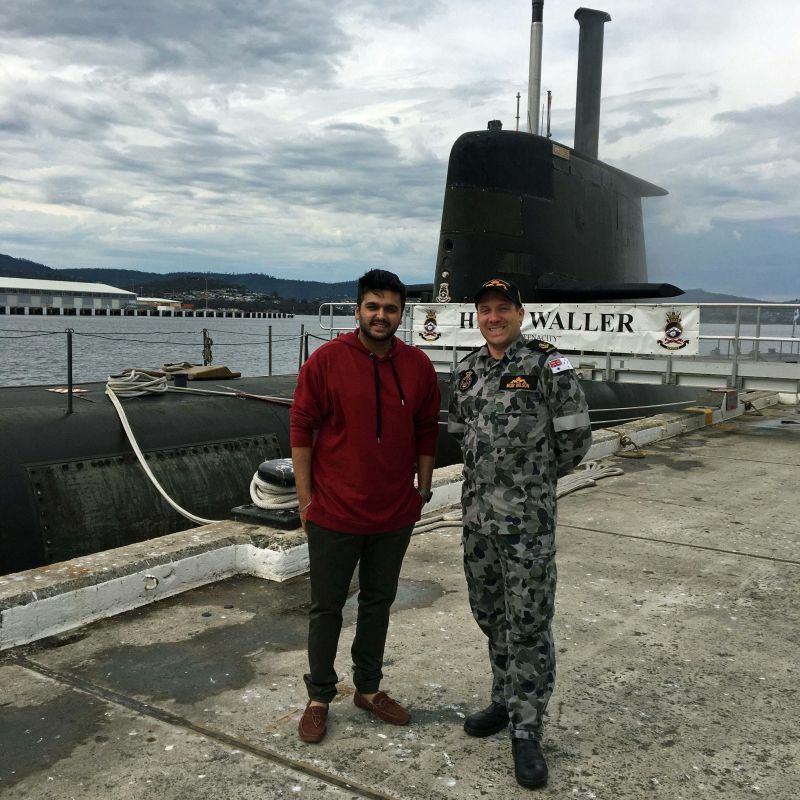 For Bachelor of Engineering (Naval Architecture) student Nathan Staffsmith, the tour provided a practical insight into the engineering complexities of a submarine. “As a Navy Undergraduate Officer through the Defence University Sponsorship, it was a great opportunity for me to see the sort of platform I’ll be working on,” Midshipman Staffsmith said. The future of Navy is exciting and seeing the components we cover in theory within an operational vessel helps build our appreciation of the platforms. Particularly a submarine with its limited space for the crew to live and work helps us learn the importance of engineering and its applications. AMC, through the Research Training Centre for Naval Design and Manufacturing, is collaborating with Defence and industry on research related to the development and acquisition of Australia’s future warships and submarines. As the national institute for maritime education, training and research, AMC will have an increasingly important role in training the professional maritime engineers and logisticians required to enable the Federal Government’s naval shipbuilding plan, through its strategic partnership with the Naval Shipbuilding College as well as associated research in support of the design, build and sustainment of the Royal Australian Navy’s ships and submarines.